Just as I await the announcements of the James Beard and Michelin Awards each year, my husband Bill awaits the Super Bowl competitors. Now that we know the Seattle Seahawks and the New England Patriots will be playing a week from Sunday, it’s time to start thinking about the food; at least that’s what Bill does. People go crazy for Super Bowl food and drink, and of course it’s always a good excuse to have a loud party. Like many football fans, Bill likes hearty fare, so I thought I would start with a stick-to-the-ribs chowder, which I suppose seems more New England even though Bill is hoping for a Seattle win. 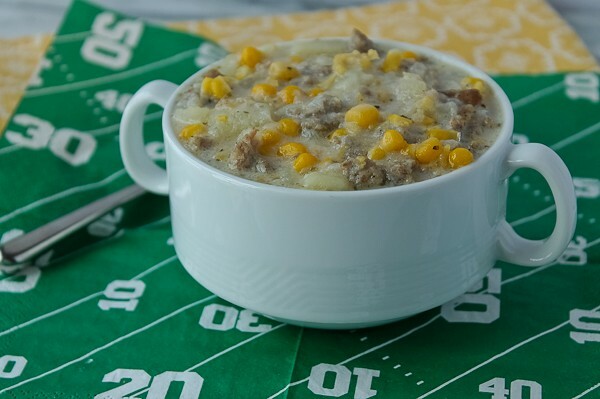 I have been making this corn, sausage, and potato chowder for years. It was even selected as a feature in Midwest Living magazine sometime back in the ’80’s about Midwest soups, and is also one of my mom’s favorites. Hope you like it, too! A good and hearty chowder to enjoy while watching the Super Bowl! *Use your favorite bulk pork breakfast sausage. My favorite is Jones Sausage, which is 12 ounces and it works fine. It doesn't have to be a full pound. **Since different sausages have different levels of salt, start with a teaspoon of salt and add up to 2 teaspoons if it needs it. In a Dutch oven, crumble in the bulk sausage; cook and stir until no pink remains. Remove cooked sausage with a slotted spoon and transfer to a paper towel-lined plate to drain; set aside. Drain off all but about a tablespoon of drippings and add onion. Saute onion until softened. Add potatoes, salt, marjoram, pepper, water, and drained sausage to pot. Bring to a boil, then reduce heat to simmer and cook for 20-25 minutes or until potatoes are just tender. Add both corns and evaporated milk to pot and heat until just hot. 3 Responses to Let the Super Bowl Food Begin! I think I will make this for lunch today! You brought up the subject of awards. When I go to the IACP (International Assn of Culinary Professionals) website,I do not see the awards for 2014. I am assuming that perhaps they wait until their conference to announce the previous years winners? I also have been searching for the Tabasco award that was given to community cookbooks. I know the company quit giving out awards, but this cookbook collector would like a complete list of previous winners! I thought “Colorado Cache” won an award, but when I look for it I do not see it. Do you happen to have a list other than the few most recent listed on their website? “Inquiring minds want to know”! Do not do any backflips trying to locate this. Perhaps you already have a list…..and know where it is? Martha, I remember the Tabasco Awards and was sorry to see them go. Unfortunately, I don’t have any kind of list, only certain cookbooks that I have collected over the years that have the sticker on the book cover to indicate it was a winner. I have Colorado Cache and will check sometime to see if mine has an award sticker.